NEW YORK CITY, NY – It’s often said that if you want to see what a person’s really like, play a round of golf with him. Personality traits aside, there’s another way to get inside a person’s thoughts, just by seeing his or her driver. That’s the case with ClubCrown by VIVE, a new invention which allows you to literally be yourself, even on the links. “Golfers get a ClubCrown to represent their style, an affiliation and their personality on the top of the most talked about club in golf, the metal wood,” said ClubCrown’s creator and CEO, Andrew Glaser. “As an avid golfer, I saw that a major item in golf that cannot be customized in an easy and economical way is the head of the golf club. Balls, Tees, Grips, etc. 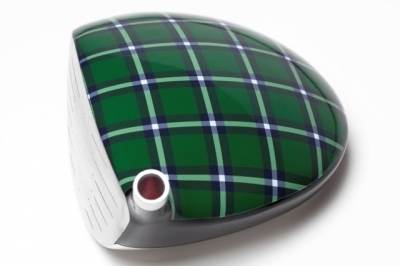 allow the golfer to personalize or customize,” Glaser explained. As a result, Glaser set out to fashion a fast and consistent process for installing a high tech 3m on a club -- one size fits all -- in under 10 minutes. He also worked with MIT and Berkley PHDs as well as experts in installing polymeric films on cars and signage to come up with the process which has since been patented. Hence, the “film” that covers the driver head, though you’d never know there’s been anything added just by looking at it. 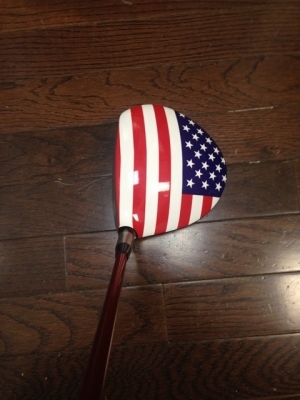 We selected ClubCrown’s American Flag design for our driver sample, and it now looks just like Old Glory was there on top of the club since day one. Having reviewed dozens of drivers, we also know that metal wood heads are extremely weight sensitive, and wondered if the addition of a ClubCrown might change the performance of the club. Glaser said not to worry – ClubCrowns add approximately 2 grams to a head. A typical club head weighs 200 grams, making this additional amount of weight immaterial. In other words, if the ClubCrown somehow alters your golf performance, the blame lies only with you. Seeing as buying a ClubCrown is a way to personalize your club, you’ll want to keep it looking nice. Will the ClubCrown ever wear out or need replacing? We didn’t have many rounds to ding-up our ClubCrown, but it’s easy to see how it should last quite a while. 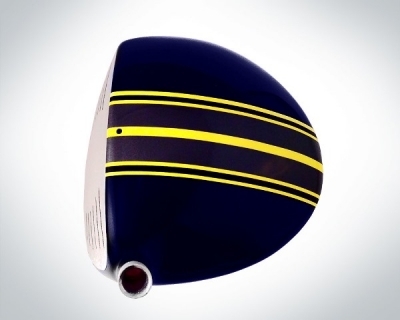 Think about it – how often does the top of a driver head really get beat up? If you keep the head-cover on the club, it will stay looking nice indefinitely. 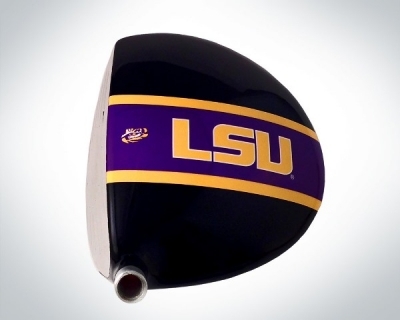 The company also offers a fairly sizeable selection of designs to choose from, including a good number of college logos for those avid fans wishing to bring a little bit of their home school to the golf course. 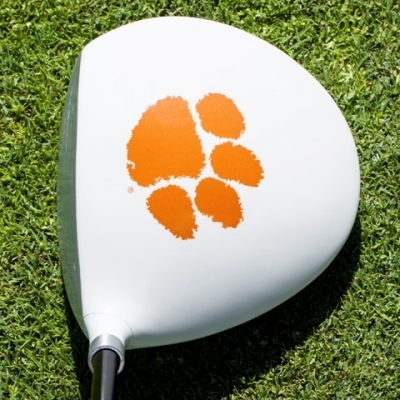 In addition, you can customize ClubCrowns with your own design, but a 12-piece minimum is required with no setup fee. Glaser noted that this is an industry leading deal and turnaround time is about a week. Not bad – we shipped our driver out on a Monday and it was back by Thursday. “We do a lot of corporate sales where, for example, Corona might want everyone in an outing to have their club sport a Corona ClubCrown,” Glaser added, saying they did just that a few weeks ago. But in order to sell trademarked items (like NFL team logos), ClubCrown would need an in-place license agreement. So there is somewhat of a limit on what designs you can choose, though the company does have license agreements with all of the trademarked product it currently sells. What about a picture or a self-portrait? A little too vain? Not if you’re willing to spring for a minimum of 12 ClubCrowns. Perhaps the biggest issue with ClubCrown at present is the relative scarcity of dealers supplying the product – it’s not like you can run down to your local shop to get one, though there are about 140 dealers currently in the U.S.
For example, we’re based in northern Virginia, and there’s a dealer about 25 minutes from us. Instead of driving the club over, we opted to ship the club to ClubCrown’s headquarters, and it’s fairly easy to do (instructions are available on the website). Glaser says their ultimate goal is to have 2000 dealers in the U.S. and they’ll continue to work diligently to get there. For now, the more people learn about ClubCrown, the more popular it grows. “A few months ago, we were at the US Kids world championship at Pinehurst. The kids absolutely loved the product and we are very excited about how big that market will be for us. We were there for two days during registration and we sold 250 units,” Glaser noted proudly. With the holidays coming up, we can’t help but think a personalized ClubCrown would make a fantastic gift – and one that not too many people have yet. Something to consider if you’d like to help someone show a little of their own personal style on the golf course. 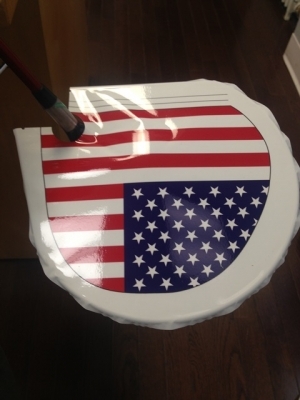 In our first glance at ClubCrown last year, as noted above, we sent our club to the company’s headquarters in New York City for application of the American Flag film to cover our driver sample. Now you can do the work yourself – mostly. That’s because ClubCrown recently introduced its STRIPE product, which allows you to install your own ClubCrown to your golf club. It’s an easy-to-apply stripe that covers the top of your driver or metal woods – just like the “full” version, but a little narrower. In addition to the cool aesthetic boost to your otherwise boring solid color metal wood, the stripe serves as an alignment aid. Place it behind the ball and you know you’re lined up for the big shot. As you’d expect, there’re a variety of STRIPES to choose from, including flags, colleges, super aim, military and STRIPES for causes. The STRIPE is similar to original ClubCrowns in most other ways described above. And you can do it yourself! Particularly helpful is an instructional video on the company website. I won’t say it’s as easy as applying a band-aid, but you won’t be cursing the inventor either. It’s hard to screw up, especially if you take your time. Like with all ClubCrowns, it’s a matter of personal preference whether you want to alter the appearance of your golf clubs. We didn’t find it distracting in the least, but some people might. If that’s the case, it’s simple to remove as well. 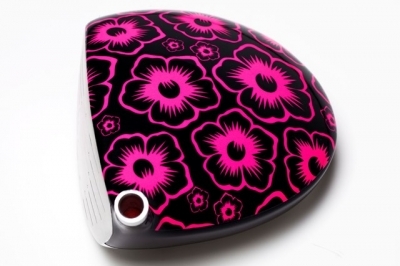 At $19.99, it’s certainly worth a shot – especially if you’re looking to add a little differentiation to your golf bag. Visit www.clubcrownstripe.com for more information and the instructional video.